New bills are being added daily with an expected total bill load of about 500. As a number of bills that could impact the hospitality and tourism industry in Wyoming have and will continue to emerge in the coming weeks. Your association will be very closely monitoring them, as they are posted and engaging as necessary. To be most effective in protecting and promoting our industry we will need your help throughout the session. Please keep a very close eye out for any “calls to action.” These typically require immediate action, will be simple to read and will include all of the information that you will need to engage. We only use the call to action when absolutely necessary so when you see one please take a moment to read it and engage. Our greatest strength is your voice and you will be needed this session to help support our industry. The following list is comprised of the bills currently listed, related to the hospitality and tourism industry in Wyoming. There will be many more bills listed in the coming weeks. This list will be updated weekly. Please watch the WTIC legislative update every Monday for additions and up to date information on our legislative priorities. 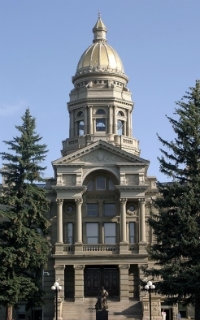 Governor’s recommended supplemental budget request of $2.5 million for the Wyoming Office of Tourism. Wyoming’s marketing program currently ranks 29th in the nation, well below most of our competing surrounding states. This funding is a stopgap that will aid in elevating marketing resources and driving more visitor traffic to Wyoming until an alternative funding source is passed. Status-Joint Appropriations Committee denied the $2.5 million request and approved $500,000. Commemorates the 150th anniversary of Wyoming Women’s Suffrage. Bill eliminates daylight savings time and would put Wyoming in a different time zone than our neighboring states for a significant period of time each year. The bill would not go into effect until three adjoining states agreed to do the same. Would remove the sales tax exemption on home-prepared foods, data centers and manufacturing. The bill would reduce the state sales tax to 3.5% and would create a tax on most services. Would amend penalties for equal pay provisions. Would create a Public Lands Day state holiday. Would allow businesses to withhold earnings from an employee that has been found guilty of theft from their employer. Stay Engaged with the 2019 Legislative General Session! ©2018 WTIC, 1825 Carey Avenue, P.O. Box 1003, Cheyenne, WY 82003.